Immediately after the war there arose a great need for business premises, particularly lettable units for small companies. This mixed-use building is variously subdivisible and includes communal zones for dispatch and storage and a staff canteen on the roof. Here Van Tijen was experimenting with his post-war marriage of concrete and brick. 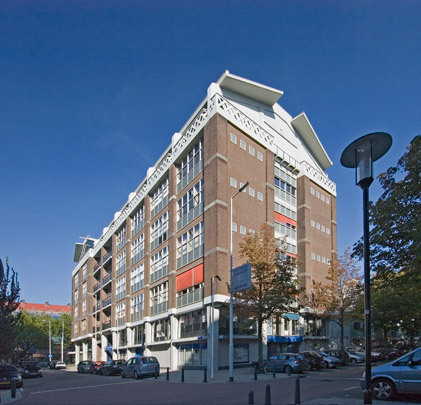 An earlier comparable mixed-use building (Oostzeedijk 208-224), erected entirely in brick due to the scarcity of cement and iron for reinforcement, has been irreparably disfigured during renovation. See also the Groothandelsgebouw and the Mixed-use Building Zuidplein.